Lions 2-158 (Neil McKenzie 68*, Quinton de Kock 51*, Lasith Malinga 1-18) beat Mumbai Indians 6-157 (Mitchell Johnson 30, Rohit Sharma 27, Sohail Tanvir 2-31) by eight wickets. Neil McKenzie tore apart the comprehensive bowling of Mumbai Indians and the young Quinton de Kock assisted him well as Lions beat the rivals easily. Mumbai Indians scored a reasonable total of 157 runs with four wickets in hand at the end of the required quota of 20 overs. Lions were struggling at 2-37 in 7 overs when Neil McKenzie and Quinton de Kock saw them through to a classic win with an aggressive batting. 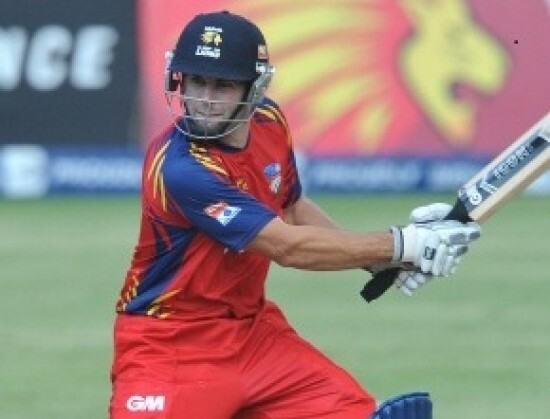 Neil McKenzie (Lions) was declared ‘Player of the match’ for his heroic knock of 68 runs. The second match of Group B in the Champions League Twenty20 was played on Sunday, October 14, 2012, at New Wanderers Stadium, Johannesburg. Alviro Petersen, the captain of Lions, won the toss and chose to go for bowling first. 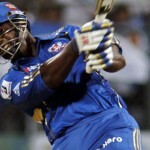 Mumbai Indians opened their innings with Dwayne Smith along with the little master, Sachin Tendulkar. Smith kicked off nicely by hitting 4 fours in the initial three overs, added another two in the fifth but was declared leg before wicket off Chris Morris for 26. The wicket fell at 45 in 4.4 overs as Tendulkar tried to force the pace of scoring but was clean bowled by Aaron Phangiso for 16 off 24 balls with 2 fours. Rohit Sharma and Mitchell Johnson tried to bring a respectful total and the first hit 15 runs in the 12th over with 1 six and 2 fours. The partnership went on to 99 runs in 14 overs when the stumps of Sharma were dislodged by Dirk Nannes for 27 runs. Mitchell Johnson kept on marching towards the stability and became the fifth victim after scoring 30 off 29 balls with 4 fours. Dinesh Karthik added 19 quick runs off 9 deliveries with 1 six and 2 fours as Mumbai Indians reached 157 for the loss of six wickets in 20 overs. Sohail Tanvir was the pick of the bowlers with two wickets whereas Dirk Nannes, Chris Morris and Aaron Phangiso shared one wicket each. Gulam Bodi and Alviro Petersen gave an analytic start for Lions and gathered 21 runs in the first four overs. The partnership was broken at 26 after five overs as Petersen was gone for 14 and 11 runs later, Bodi followed him at his personal score of 19. Quinton de Kock and Neil McKenzie steadied the innings assisted with regular boundaries. McKenzie added 10 runs in the 15th over and the hundred of the innings also appeared on board. The duo went after the bowlers at the right time and the 16th over produced 17 runs with 3 fours. Neil McKenzie smashed his 14th T20 fifty on the first ball of the next over bowled by Harbhajan Singh, the skipper of Mumbai Indians. McKenzie punished Harbhajan for 4 fours all around the park in that particular over, toyed with his bowling and made the target easy for his team. The Lions required 19 runs off the last 18 balls that was not a difficult task for them while having eight wickets in hand. The 19-year-old Kock thrashed his fourth T20 half century on the third ball of the 19th over and McKenzie hit the winning run two balls later. The third wicket unbroken association hammered 121 runs on mere 72 balls as the Lions reached 158 for the loss of just two wickets in 18.5 overs. It was the highest third wicket partnership in the Champions Legue Twenty20. Neil McKenzie remained unbeaten for 68 off just 41 balls with 12 neatly placed fours whereas Quinton de Kock held his end with 51 from 33 deliveries that comprised 2 sixes and 5 fours. Lions won the match intensively with a huge margin of eight wickets and secured four points.